As an entrepreneur, I find it hard to do nothing. I always want to be building something. I need to be building something. That’s why, during the process of documenting #TheGreatBuild project I became frustrated so many times. For those that are maybe just reading my blog for the first time and don’t know, my new ecommerce business which I have been documenting through a blog series called #TheGreatBuild is called Finch Goods Co. Many people have asked me where the name Finch came from and why I choose Finch Goods for the name of my new business. Truth be told, it was the name of the street I grew up on. It was the place I lived, the place I played, and it was the place of my first dozen entrepreneurial endeavors, mostly in the form of lemonade stands, vegetable stands, a makeshift hockey card pawnshop and garage sales. The name Finch Goods Co. is a tribute to my early entrepreneur days. Finch is also the name of the closest subway/bus station, and up until I had a car, it was my access point to the rest of the world. If I wanted to go anywhere I passed through Finch Station. 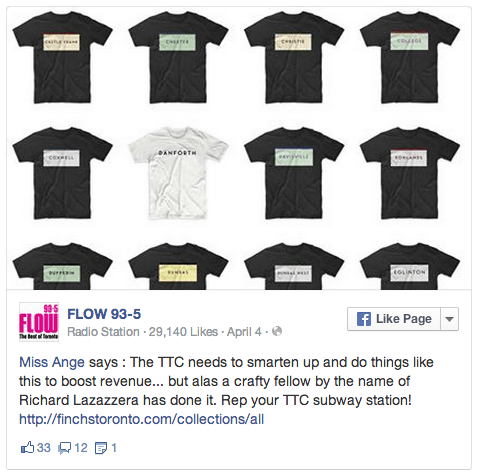 Because of my sentimental attachment to Finch I designed a t-shirt based on the typography, colors and tile pattern of that station in late February. Fast forward a few weeks to a night in April. I was working on #TheGreatBuild project (Finch Goods Co.) and getting close to launching. However, I was stuck. Everything was ready to go except I was waiting on some inventory I intended to launch with from a supplier. I had nothing to do. As an entrepreneur, nothing to do is a terrible feeling. It feels it exact opposite of progress, probably because it is. 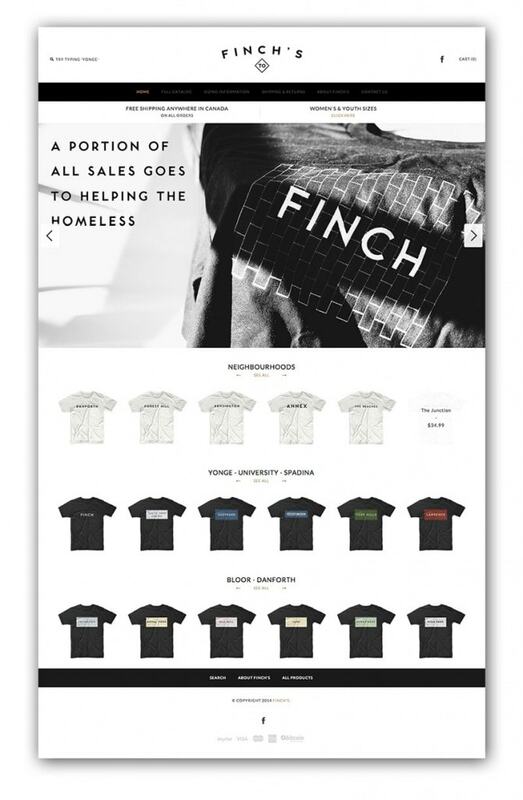 Growing anxious to launch Finch Goods Co. and not being able to, I stared blankly at my computer for a few minutes, my screened darkened and went to sleep. 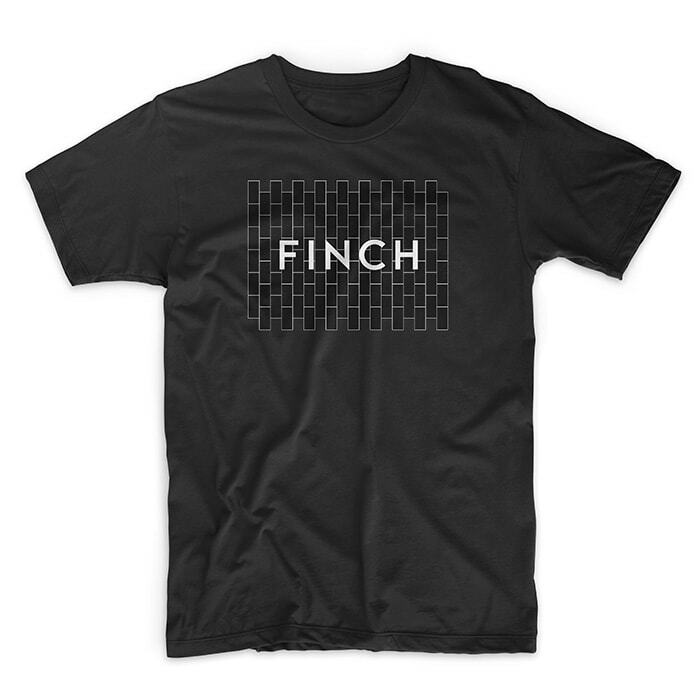 In the reflection of my black screen, I saw my shirt, Finch. 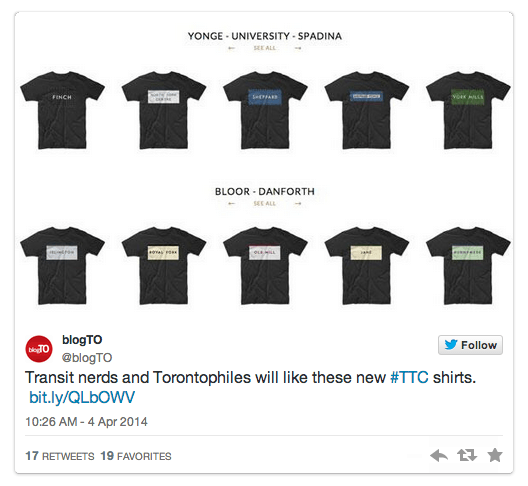 The idea of hyper-local t-shirts was one I was sure people were interested in. Our city definitely has a lot of pride and after some cursory Google searches, I found nothing similar. The closest was a series of vinyl wall decals with the various stations typography. Searching for that companies name on Google I found several online news articles about them. They had been running their business for 5+ years so in theory they were doing well. I had 24 hours to build it – No more, no less. It had to be fully automated once live. Under these rules, building the entire business would essentially act in-itself as the validation. 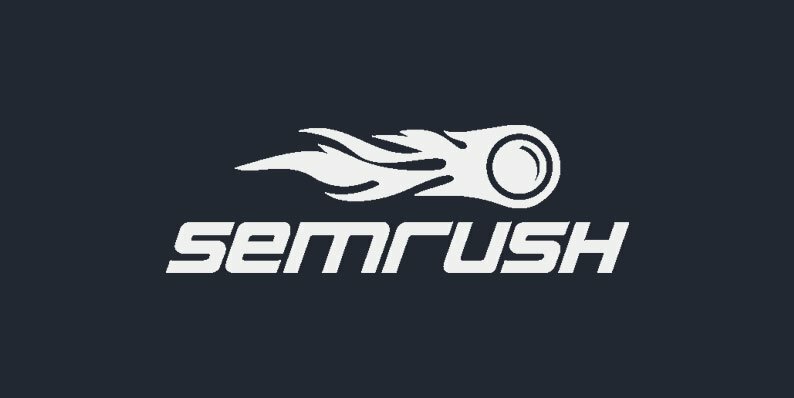 Which ecommerce platform was I going to use? How would I print the t-shirts and ship them in a automated way? For me, number one was easy. Unless number two forced my hand another direction, I would use Shopify. It’s the platform I know and love, it’s the easiest to use in my opinion and it offered the most amount of app integrations, which I knew is likely where I would find a dropshipping company to print and ship custom shirts for me. I immediately headed to the Shopify App Store and searched for “t-shirts“. The search returned approximately six t-shirt printers/dropshippers. 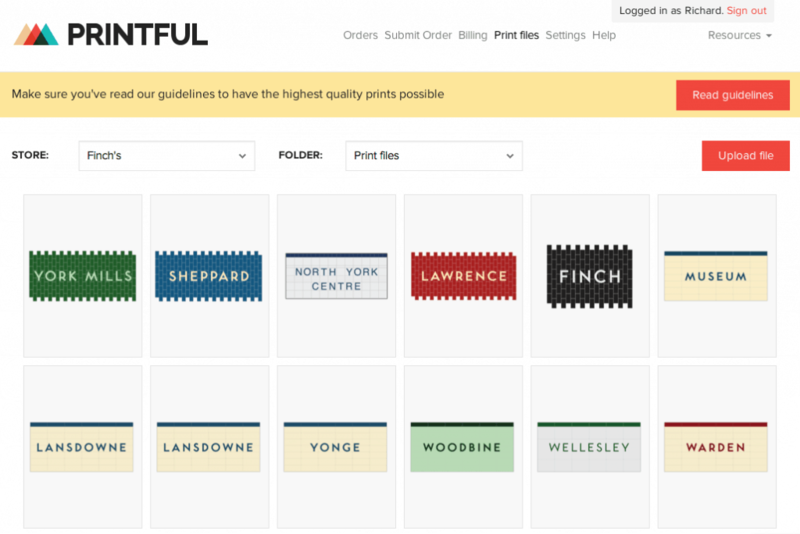 After scanning through all of them, their integrations, their t-shirt options and pricing, I decided on Printful. Printful it seemed had the most seamless integration, best selection of shirts and reasonable pricing. They also had the ability to print other products like canvas prints and bags should I ever decide to expand my product offering. With my ecommerce platform and printer/dropshipper decided upon, it was time to work on the designs. Now, Toronto has over 60 stations and I completely underestimated how grueling and exhausting it would be to design all 60, luckily, many of the designs had a similar style. Over the next 6 hours I cranked out all 60 designs for almost all of the stations. With all 60 designs complete, I thought I was done. However, I quickly realized that very few people would buy a design without knowing how it looked on a t-shirt. With that in mind, I headed over to my favorite graphic design marketplace, Creative Market. 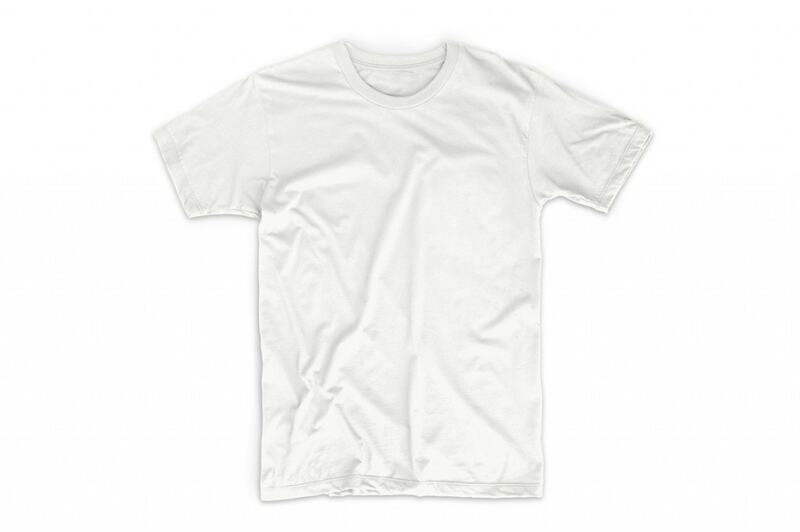 I searched for “t-shirt template” and quickly found a really slick template for $8. Now that I had the t-shirt template and all my files, it was once again a manual process of applying all 60 of my designs to the t-shirt template and saving each file. With all my t-shirt designs completed, it was time to build the website. I signed up for Shopify’s 14-day trial and got to work. I already had a theme I had purchased for Finch Goods Co. so I might as well use it for this project as well. When it came naming a business, I know it can sometimes take weeks. I didn’t have that long. I decided to allocate 3 minutes to naming this business. As confusing as this was (mostly for my friends and family) I decided to call this business, Finch’s. 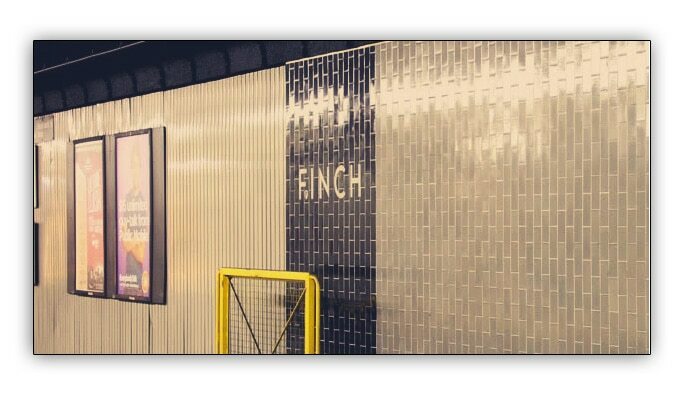 Again, this was named after the street I grew up on, the subway station closes to my childhood home and, it just so happens that Finch Station is the first station on the subway line. I designed the website to be as simple as possible, even keeping the same colors scheme from Finch Goods Co. The most time consuming part was creating each of the 60 products and uploading the right photos for each. Organization was key. The last step before I launch and market my new online store was to integrate my store with Printful. This was an easy enough process. I installed the Printful Shopify App, and from there it automatically pulled in all my products. All I had to do at that point was upload the design file to each product and select the type/style of shirt I was going to use. At this point, I was pretty tired and really had no idea what I was going to do for my marketing. However, I did remember that just the previous week, the subway celebrated its 60th anniversary. Could I use this to my advantage? I did some searches on Google to see who covered this event. One stuck out immediately. 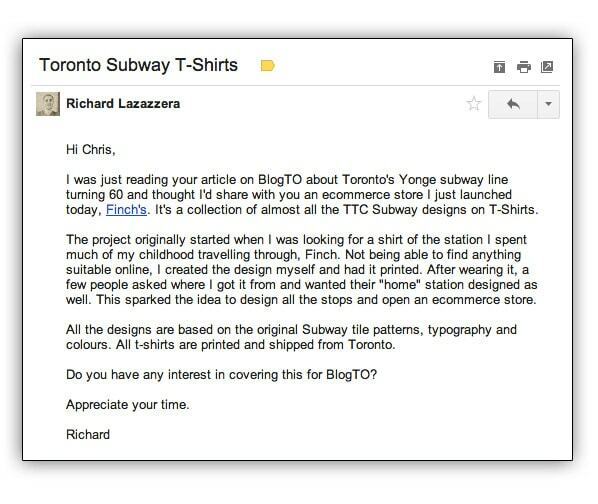 It was a pretty popular local online blog and they just wrote an article about the subway systems 60th anniversary. I figured the author of that post might want to hear about to my newly released shirts. Within the hour he replied asking a few more questions. It was late and I was exhausted. I decided to leave the response until the morning. Besides, I still had a few things left to set up in my Shopify account before launch. The next day, I woke up to the dinging sound of emails coming into my phone, *ding*… *ding*… *ding*. After ignoring the first few, I finally rolled over and checked my phone. To my surprise it was a bunch of emails from customers asking about my shirts, shipping and pricing… customers? I haven’t even officially launched yet! I quickly opened my laptop and discovered a big spike in traffic to my site. Although I had not “officially” launched, my site was live, however, I still had not turned on checkout, so no one could actually checkout. First priority was to turn checkout on and complete a test order to make sure everything was no working. After I did that, I checked to see where the traffic was coming from. Turns out, the writer went ahead without my email responses and published a post about my store. I also received a handful of other emails from people interested in collaborations and promotions with my line of tee’s. Furthermore,that day I also received some favorable social media mentions from BlogTO as well as a local Hip Hop radio station and a handful of other locals. Admittedly, after the spike in sales from the initial media coverage, sales dropped. In fact, since that first 24 hour sales period, I’ve only made a few hundred more dollars, however, I have done ABSOLUTELY NOTHING and everything is 100% automated. I have not, and I have no need to login to anything for sales and orders to be taken care of. Since my initial email that sparked my initial sales I haven’t done anything else for marketing. That one blog post continues to deliver a small trickle of sales each week. 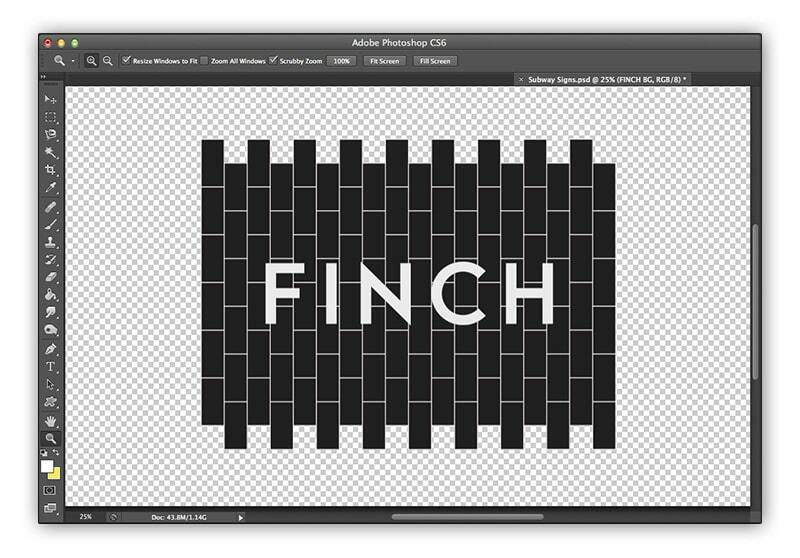 Most of my time now is spent on my new project, Finch Goods Co. so I have almost no time left for this project. 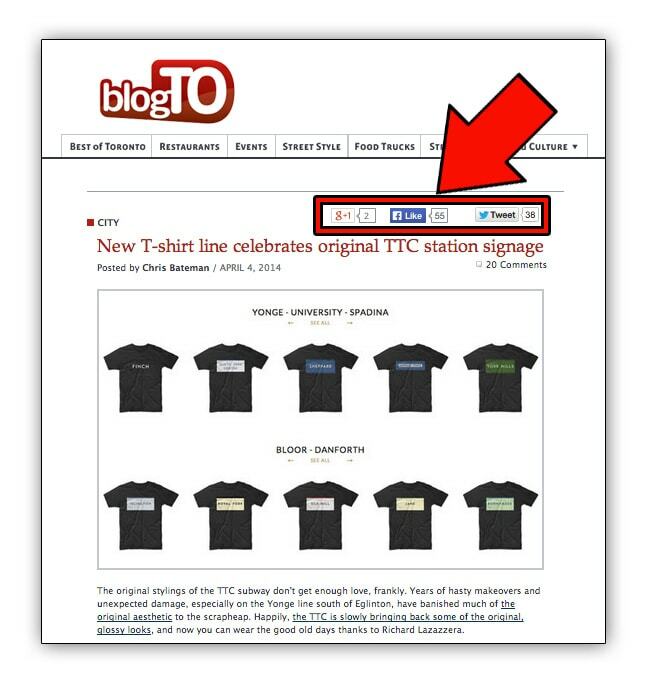 However, when I do get some time, I am going to focus on SEO around some keywords I uncovered that I believe have potential to deliver a steady stream of high quality traffic for people looking for localized Toronto t-shirts. Again, I want to keep this project as automated as possible so SEO is going to be the biggest opportunity to achieving that. 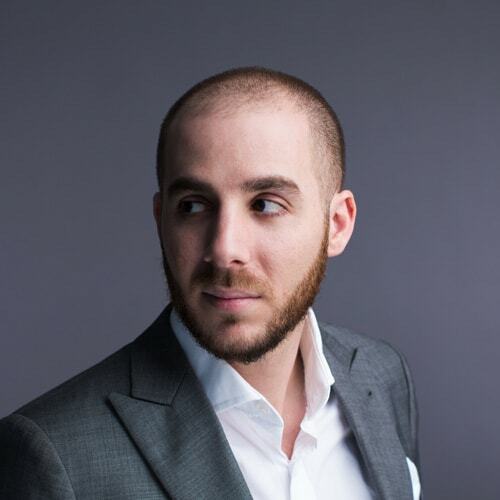 T-Shirt entrepreneurs get a bad rep (I’m looking at you reddit) however, I believe t-shirt businesses play an important part of the online entrepreneurship ecosystem. They are in many respects, a modern day lemonade stand (no pun intended), they are can be started quickly and with no money. They don’t know what to sell online – They spend months and months looking for a product, before giving up. If they do find a great product and start their first business, they have no idea how properly market their product and business to drive traffic and convert that traffic to sales thus a great product or idea is squandered. Starting a t-shirt business helps with both of those factors. First, if you’re struggling to find a product to sell, you will automatically have a product, t-shirts (these printer/dropshippers also usually offer other products as well, like canvas prints, mugs etc.). Second, an online t-shirt business gives you a way to start understanding online marketing, before you sink some real time and money into a more serious business. 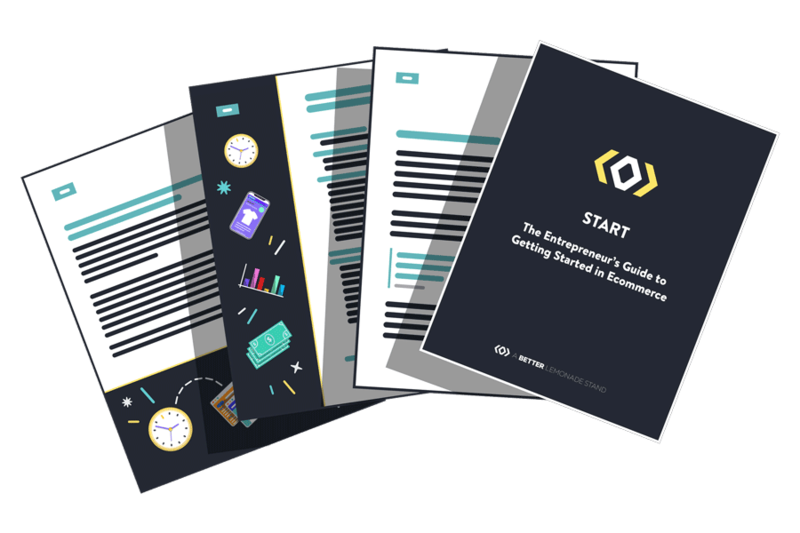 Remember, and never forget, you’ll learn 100x more from actually starting a business, than you ever will from just consuming articles, blogs, books and podcasts. There is no substitution for real world experience of building traffic and learning to convert it. Niche: Choosing a niche is absolutely vital for success in the over-saturated t-shirt industry. Design: No one will buy your shirts if the designs don’t look good. This doesn’t mean you need to have complex images though and it doesn’t mean it has to cost a lot. Quality: This includes the quality of the t-shirts themselves as well as the printing. There are plenty of options available for your actual selling platform. Platforms like Teespring have become popular lately, however, options like this aren’t good if you’re trying to learn more about digital marketing and branding. Going with a platform like Teespring means your product ideas live on the Teespring platform and doesn’t give you the option for your own branding, deep analytics or conversion optimization. If you’re serious about building a brand or learning more about digital marketing & optimization and strategy, you need to go with a more customizable option. I can’t recommend Shopify enough. 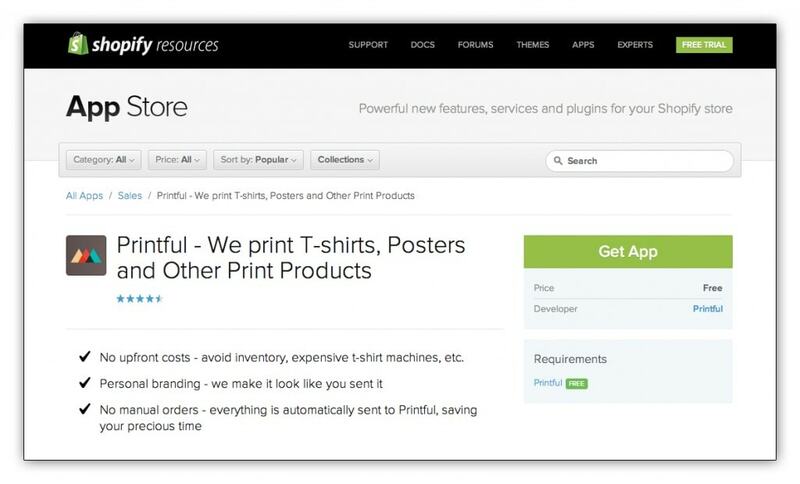 Not only is Shopify one of the easiest platforms to get started with but it’s app store is the most robust and has a host of integrated t-shirt printers and dropshippers. There are a few considerations when choosing a printer/dropshipping partner for your new online t-shirt business. These considerations include the t-shirts they have available to print on, t-shirt/print pricing, shipping pricing and quality of t-shirt prints. If using a printer/dropshipping like I did, you t-shirt selection (type/style/quality) will partially depend on what you printing/shipping partner have chosen to stock. Most will provide a range of shirts to cover several levels of quality and price points. USA made American Apparel is largely considered the best quality however if comes with a much steeper price point which will significantly cut into your margins. For my 24 hours business, I went with a medium quality/price t-shirt style/brand. You can choose to order a few samples before deciding on your t-shirt but I would recommend you check out this review guide on the most popular t-shirts for printing to get started. 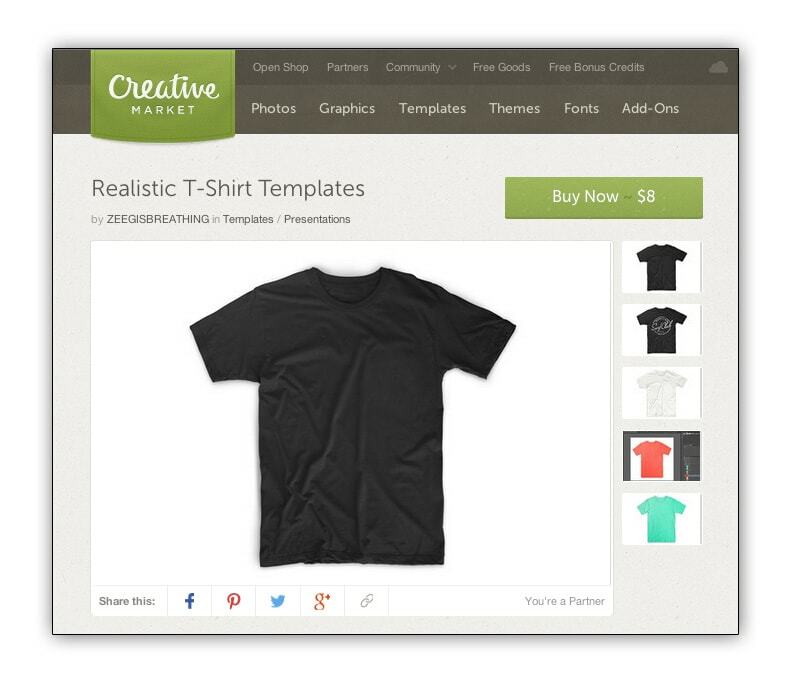 There are literally hundreds of t-shirt mock-up templates available online, both free and paid. Here’s a list of 50 free templates, or if you want to use the same one I did, just go to Creative Market and search for “Realistic-T-Shirt-Templates”. It should be the first one. If you are too lazy to read everything above, I have rounded up all the resources below that you can use to build your own online t-shirt store, fast! A Staple of Branding: How to Start Your Fashion Company by Jeff Staple, Founder, Staple Design. Hey, Cool Shirt: Designing Effective T-shirt Graphics by Chris Delorenzo, Lead Designer for Johnny Cupcakes. There you have it. A new business born in 24 hours with only $24. All in all, I had fun building it. The challenge of building a fully automated business in 24 hours was pretty exciting and the fact I was able to generate over $300 in sales in the first day was well beyond my expectations. Granted, this business will never make me rich and margins are generally slim however, as I pointed out before, I firmly believe a t-shirt business has it’s purpose, even if that purpose is just practicing for something bigger. Now it’s your turn. If you’ve been thinking of starting an online business but have been stuck in the “I don’t know what to sell” stage for more than a few months, I am challenging you to build a a t-shirt business, for no reason other than to start. Start building something, start marketing something, start converting something. Start.